The greatest stories are the real ones about real people and real feelings. Whether you’re writing a novel, blog, or a personal memoir, it’s the stories of families that are most endearing, relatable, and timeless. But how do you collect the many touching and funny moments from today, your own childhood memories, and your grandparents’ stories? 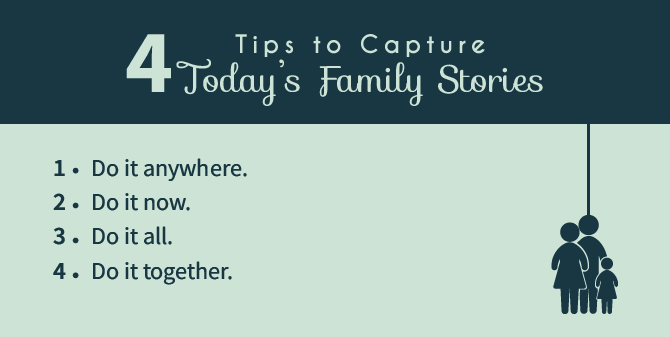 Today we’ll give you some tips to help you capture and immortalize family moments and stories. Sometimes our family moments and inside jokes seem like they wouldn’t interest anyone else, but it’s the funniest family moments that go viral in tweets. Oddly, it’s the seemingly bizarre and outlandish stories that are most relatable in blog posts. Has it always been like this? Literature Noble Laureate, John Steinbeck, spent his teen years listening to the stories of his neighbors in Salinas and would lock himself in his room writing for hours–those stories later turned into his award-winning classics. Charles Dickens’ epic stories, particularly David Copperfield, grew from his difficult childhood. The riotous family anecdotes of the motion study industrial engineer, who paved the way for modern-day ergonomics are immortalized in the hilarious memoir Cheaper by the Dozen, written by two of his dozen children, Frank Bunker Gilbreth, Jr. and Ernestine Gilbreth Carey. The list is endless. The point is simply that throughout time, people love family stories and love telling them too. While cameras and pictures can capture images and videos of our most precious moments, writing can add other dimensions to those moments. It captures feelings, states of mind, and maybe even the scents in the air―whatever you choose to put into words. As you record these moments, everything comes back to you. You re-envision the moment as you’re overwhelmed by the rush of memories. As people read your words they live vicariously through your words, entrenched in your world or reliving their own memories. Facebook posts. Twitter posts. Chats with your sister. Don’t wait till you have quiet alone time to sit on your computer and write volumes of your family folklore. It will likely never happen. A few well-chosen words will keep those memories alive and documented. Write dialogues out, while you still remember them. In a couple of days, you’ll already start forgetting the jewels of wisdom that could only come from the mouths of your toddler nieces and nephews. So profound in their simple and complete misunderstanding of life. Don’t skimp on the details. We all want to know the juicy details. Particularly indulge us in the sensory details. The stuff that helps us imagine exactly what it’s like to be where you were. We want to know what your home smelled like. Was it the wholesome scent of fresh baked goods, or the sweat and alcohol of a father who toiled in the hot sun and drank to forget his pain, or the smell of nail polish and remover of a tween sister who changed her nails with every outfit? Get the rest of your family in on it. You’ll gain new perspectives and draw yourselves closer to one another. Withdrawn cousins suddenly come to life behind a keyboard. You don’t have to use dedicated family apps to connect. You can simply create a family group on Facebook, and begin sharing stories. 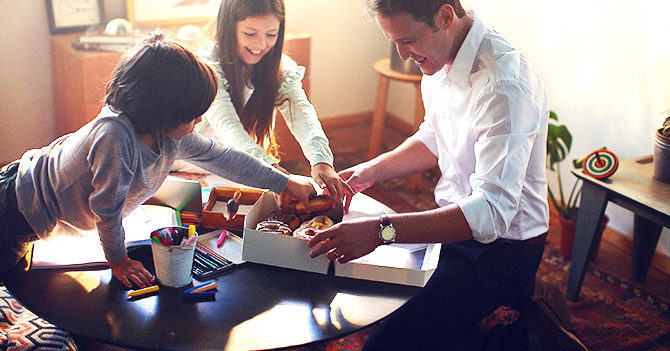 The range of precious moments you can unveil with the help of older generations in the family is endless. It can be that your great uncle had once battled an alligator and won. Or that your secluded aunt who never leaves her house in the countryside had actually lived through a torturous war. Or even that your dad met a rock legend you idolize back in his wild teens. These stories can be the doors to better understanding your family members and appreciating who they are as well as the lives they’ve lived. It’s important to record these memories, and there are a number of techniques and simple tricks to ensuring you document your family’s stories for posterity. Your personal reasons for wanting to learn and write about these stories can actually vary, and each one is valid in its own right. Your reasons may even encompass a combination of all of them. There are times where you can struggle with who you are as a person, where you came from, what your family was like, especially if you don’t live where your family grew up, or if you come from mixed cultures. The not knowing can be irksome. So hearing these stories can be a way for you to understand yourself and where you come from. Then writing the stories helps you through deeper levels of processing how everything came about. Sometimes you hear your family members referencing things in passing that you just don’t understand, from places to day-to-day tools that sound made up, to events that took place but you’d never been told about. It can be a frustrating thing to feel so left out of the loop when it comes to something so commonplace for rest of the older generation. When you write about them, what may have been forgotten forever, lives on. We all go through things in life, good things, bad things, horrific things, and it’s nice to know that we’re not alone. Maybe it’s our inherited characteristics, maybe it’s our family culture, whatever the reason, often times we’re surprised to find that distant family members have gone through similar stories of heartbreak, and similar stories of angst, depression, and anxiety. Listening to someone older, who has been through what you’re going through and got out of it, is invaluable. Then writing those stories for others to benefit can be euphoric. That was just to name a few, there are so many other driving motivations. Basically, documenting these stories, putting them down in writing is just one way to acknowledge and respect their existence, and how you can create a family legacy that can last a lifetime for you and others. A challenge you may face to reach your goal of documenting the long almost forgotten tales of your living relatives would be to actually coax the stories out of them. While some family members may be really talkative, others are rather reserved. And even the ones who constantly talk might not be saying what you are seeking, whether it’s due to some trauma they’d had to endure, or for our own protection, or out of embarrassment. Therein lies the problem, finding the right way to make them want to tell their stories. However, once you get talking, and show them that you do indeed understand, that you’re no longer a child and are certainly willing to learn more, it will be easier for them to open up and start talking. More often than not, people like to know that others want to hear their stories. They get excited and start talking enthusiastically. On the off chance, they’re still hesitant or not comfortable enough to delve into their past, you need to show compassion, patience, and real interest so that you can ease them into it. Invite your elder relatives and all their friends, as many as you can gather. They’ll be happy to see their old friends. The energy that will gather as they all start chattering is warm and exhilarating. You’ll see the silent elders in your family turn into chatterboxes, when surrounded by their friends and old memories. One of the fun surprises of having friends in the group is that they can coax stories out of each other better than you. You’re younger and possibly shy, but they know each other better than you know them. They know what old stories to dredge up, that may have been otherwise concealed. They also know how to convince each other after years of friendship. There will be countless references that you don’t get, especially when in a group setting. Ask about them, and you’ll probably get an “Oh that’s a long story, honey.” I can almost guarantee that the long story is far more interesting than the original story. Soon, you’ll find that they go off on tangents as things they would have otherwise been forgotten are triggered in the telling of their story. The tangents, in this case, are what bring the story together —memories are often linked by theme rather than chronology. You can piece the chronology together later if need be. 5. Don’t rely on your memory. It’s easy to forget exact words, details, and you’ll want them later when you sit down to write. Ideally, they’ll be comfortable with a video or audio recording. In addition to getting the full picture when it comes time to write the story up, you’ll have something that captures their voice, verbal ticks, and unique phrases. As you rewatch the video or re-listen to the audio, you’ll pick up on things you didn’t notice at first. If they’re not comfortable or self-conscious about live recordings, consider taking notes as a next to best alternative. It’s still a great way to keep everything clear in your head and keep yourself from forgetting anything as the stories keep rolling in. Maintaining eye contact rather than looking at your notebook the entire time can make them feel more comfortable. If you find the note taking is making them uncomfortable, then stop. If you find it difficult to take written notes as your relatives speak, whether it’s because they’re going too fast or they refuse, then write everything immediately afterward, while it’s all still fresh in your mind. 6. Explore old photos or treasures. Some people feel uncomfortable talking about themselves. Start conversations with questions about old photos. 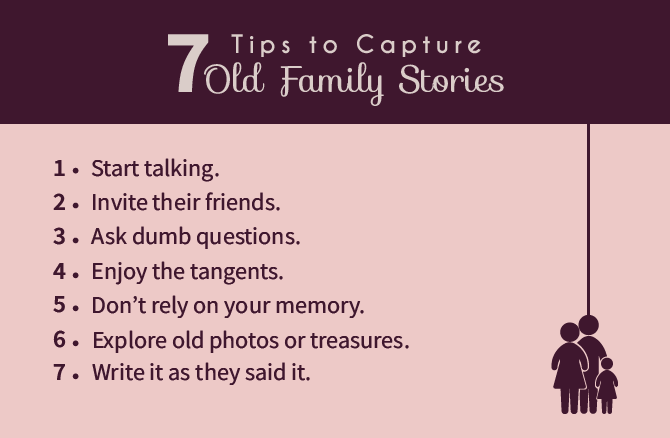 If your family members have difficulty recalling events or parts of the stories they’re telling, sometimes it’s useful to have some visual clues to jog their memories. Seeing a photo will trigger all of their senses and transfer them back the moment the photograph was taken in, and you’ll soon find out details you hadn’t previously known. Photos are not the only visual clues you can use to evoke some memories. Even the smallest item or trinket can work wonders depending on the person and their attachment to them. 7. Write it as they said it. When it comes to writing a full text of the stories you’ve gathered, it’s important, both for you and your readers, that you maintain an authentic voice. Think back to how your relatives talk, and when you write down the story, ensure that you scatter it with key phrases or their unique ways of saying things. Showcasing your relative’s voice makes it more real and relatable so that readers wouldn’t be detached as they read it and feel emotionally invested in the story. Documenting your family’s stories is like putting parts of their treasured history in glass casings for you to go back to whenever you feel like reading them again. We should immortalize those stories, both for our sakes, theirs and future generations’ as well.